The Gospel is a contemporary drama about love and redemption set in the world of gospel music and the African-American church. Starring Boris Kodjoe and Idris Elba, the film is written and directed by Rob Hardy and produced by Will Packer and executive producer Holly Davis-Carter. Shot entirely on location in Atlanta, The Gospel also stars and Nona Gaye, Tamyra Gray, Clifton Powell, Omar Gooding, and Keshia Knight-Pulliam co-star, joined by gospel superstars Donnie McClurkin and Hezekiah Walker, who make their feature debuts. The Gospel features original music by uber gospel music performer/producer Kirk Franklin and performances by some of the biggest names in the genre, including Yolanda Adams, Martha Munizzi and Delores �Mom� Winans. Set against the backdrop of Atlanta today, The Gospel stars Boris Kodjoe as a hot R & B recording artist who�s at the top of his career, yet estranged him from his family who are southern Christian leaders in his hometown church. When David learns that his father (Clifton Powell), the Bishop of their church is ill and near death, he returns home. There he is forced to face demons from his past that strike at the deepest nerve. He discovers that his childhood rival (Idris Elba) is poised to become his father�s successor at the church and has even married David�s cousin (Nona Gaye). While being met with hostility from family members, he also discovers disloyalty within the music empire he is building--all while struggling to make peace with his family, God and himself --in The Gospel. 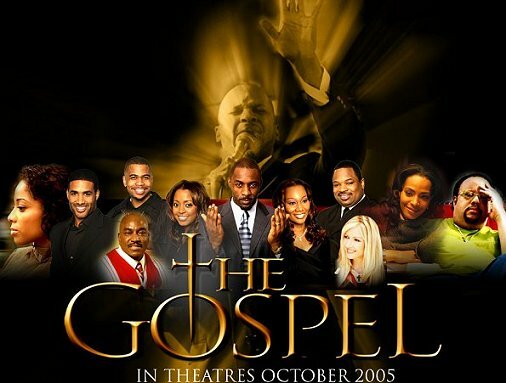 The Gospel was released in theatres by Sony Pictures/Screen Gems on Friday, October 7, 2005. Buy the soundtrack CD NOW! Buy the DVD NOW!